That would be indeed, but don't forget the limited space.. I think it would be interesting to create a standalone map for north germany in a bigger scale. Maybe like the Niedersachsen map project in 1:5. The mapper of the Niedersachsen map is building Hannover and cities around there and if some one would map north of lower Saxony these maps could be combined would a nice idea. Then there were much things possible. Even the Wischhafen Glückstadt ferry. But that is only an idea from me and I am not able of mapping unfortunately and now I am going off topic. Ähm another question for me would be what is planed or what will be there in southern Germany? Are there some new areas as well or only the already existing areas moved to the new map? Would Frankfurt am Main be the same City as before? 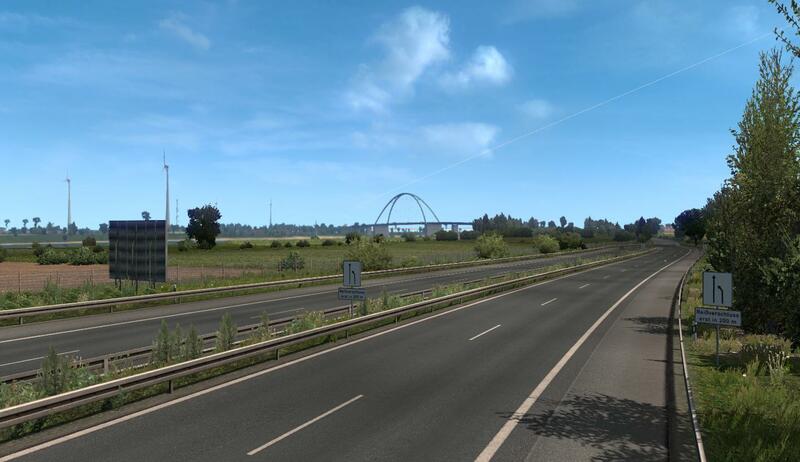 Would be this scs built Stadtautobahn leading into the city part of it? Or Nürnberg or München? Will they be the known promods cities? I am hoping for it cause they were made so great. And a last question regarding Fehmarn. There was this nice Screenshot from the Ferry port with sight direction south and in the Background we can see a new model of the Sundbrücke. But it looks farer away as before. Is the new Fehmarn now bigger than before? Or is the bridge model smaller and it only looks that way? A gameplay inquiry here, folks: Will the merge of the ARP and the SCS Rebuild enable the German Special Transport routes, or will their sectors still be affected by ProMods (and thus, being unavailable)? I fear that still many/all German Special Transport routes will be disabled in our mod. On a different note, some people were wondering about the new fehmarn bridge, hence why I decided to make another teaser. Wooooowwww, what did you do there??????? Has Fehmarn enlarged??? Such amount of detail could not fit on this small piece of Land what is is still now?! These Screenshots are fantastic!! No, not just fantastic, ULTIMATE!!!! Your first Screenshot looks very close to the real world, at least from this distance.. But I think at this point the A 1 Autobahn must already have ended and startet as B207 /E47. If you have Heiligenhafen as a Scenery city the A1 has to end there.. And this is no longer a construction side. Maybe it will be later if the tunnel to Danmark comes. Then the A1 will stay at 4 Lanes (2 per direction) and will lead over the isle, through the tunnel to Danmark. But if it will come so, they need a new bridge, cause the bridge has a road with 2 lanes (one per direction) one sidewalk and a train track.. For a 4 lane Autobahn there won't be enough space. But for now the tunnel to Danmark is no sure Thing. So we will have this beautiful bridge some years further.. 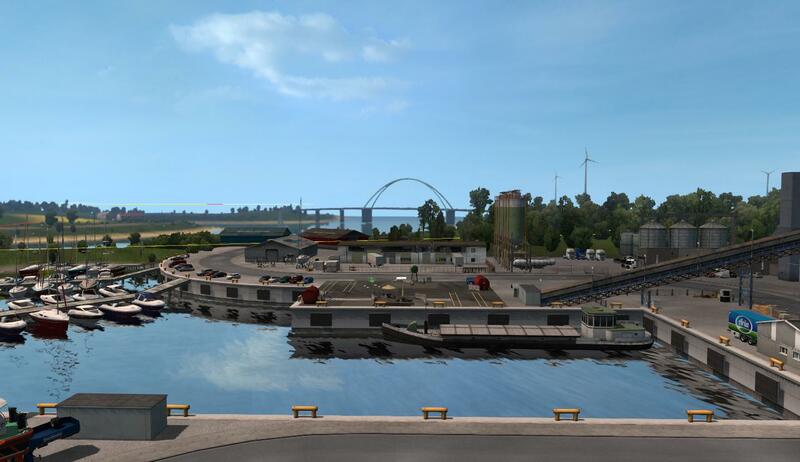 The second Screenshot might be the harbour "Burgstaaken" that is normally no big point for Trucks. The farmers bring their wheat there to the silos, there are some small fishing ships, there are some touristships for short trips around the isle, there is a submarine museum with a submarine and a rescueship museum with a small rescueship.. The most where Trucks get to Fehmarn would be to the Town to the Area where the big stores are. Fehmarn is interesting for Scandinavians for buying alcoholic drinks there. I learned that many Scandinavian Countries and at Danmark too, there are high taxes for alcoholic drinks, so they can come here and buy it here free of charge. Anyway, your Screenshots looks fantastic. Fehmarn is my favorite island in germany, I go there with my family almost every year for vacation and my father is born there, so I like these island a lot. Thank you Nico for these new pics. They are very Beautiful just as the original. I am very looking forward to drive there..
MG Mike, most of the ProMods is interesting, altho I do not always post much. As it seems they found a suitable ferry now and the new company wants to start right at time to the Easter holidays. The ship is a Norwegian ferry named "Fanafjord"
The only problem right now is that from the beginning of February there is a speed limit for ships which are longer than 90 meters at the Elbe. They are now allowed to drive only 15 knots. The distance Cuxhaven Brunsbüttel for the ferry is 16 Sea miles, so the ride would to very Long. The company is now asking for a special allownes for higher speeds. Fanafjord, that is interesting. MF «Fanafjord» Marine Traffic info. Currently it is on the Halhjem–Sandvikvåg line on E 39, Norway "remember the old Stavanger-Bergen road with ferries in ProMods?" There have been plans to replace the old ferries with new, but delivery has been delayed. When they get the planned ferries, maybe 1 or more ferries might be available for Cuxhaven - Brunsbüttel line?